Falafel is a fried ball or patty made from spiced chickpeas and/or fava beans. Originally from Egypt, falafel is a popular form of street food or fast food in the Middle East. Falafel is usually served in a pita-like bread called lafa, either inside the bread, which acts as a pocket, or wrapped in a flat bread. The falafel balls, whole or crushed, may be topped with salads, pickled vegetables and hot sauce, and drizzled with tahini-based sauces. 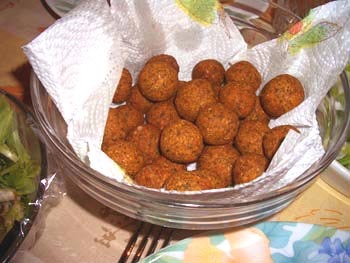 Falafel balls may also be eaten alone as a snack or served as part of a mezze. During Ramadan, they are sometimes eaten as part of an iftar, the meal which breaks the daily fast after sunset. Falafel is made from fava beans or chickpeas or a combination of the two. The Egyptian variation uses fava beans exclusively, while other variations may use only chickpeas. Palestinians and Yemenite Jews in Jerusalem historically made their falafel from chickpeas and parsley only, as in Syria and Lebanon, and this continues to be how falafel is known throughout the Levant today. Unlike many other bean patties, in falafel, the beans are not cooked prior to use. Instead they are soaked with bicarbonate of soda, then ground with the addition of a small quantity of onion, parsley, and spices such as cumin and coriander. The mixture is shaped into balls or patties, then deep fried. 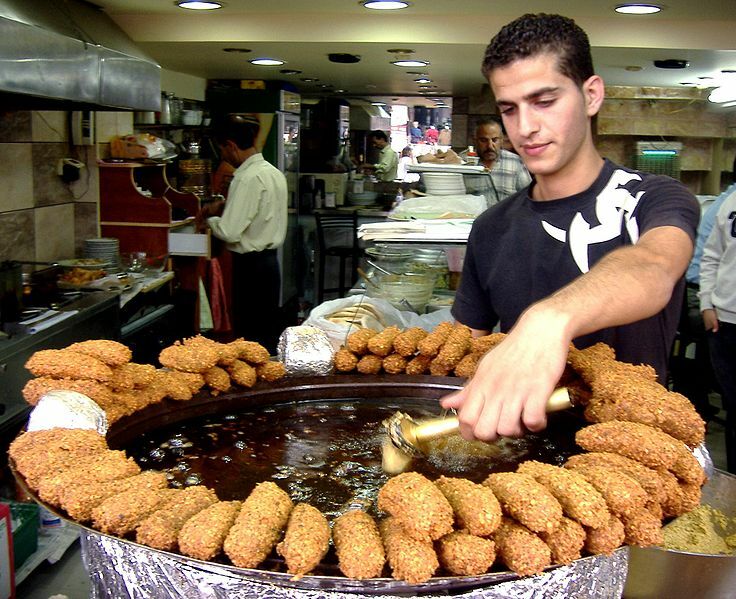 Sesame seeds are sometimes added before frying; this is particularly common when falafel is served as a dish on its own rather than as a sandwich filling. Recent culinary trends have seen the chickpea supplant the fava bean in popularity. Chickpea falafel is served across the Middle East and has been popularized by expatriates of those countries. However, fava-bean falafel continue to predominate in Egypt and Sudan and their respective expatriate communities. Left: Falafel production in Ramallah, West Bank.